Natuk Paniyuk, 67, and her 71-year-husband came across a polar bear last week while heading out to get water. 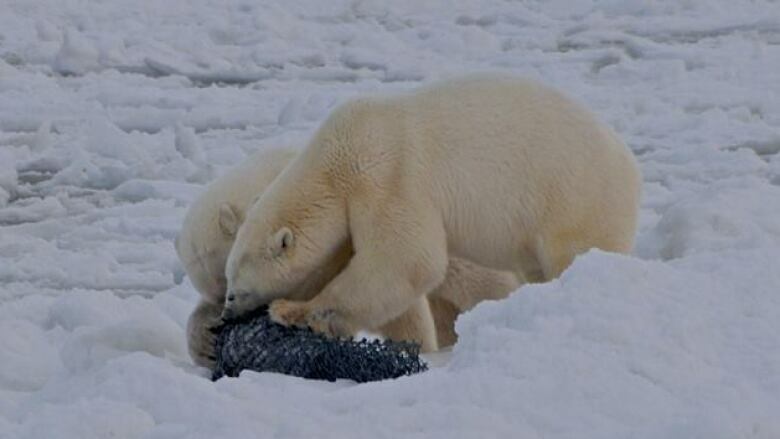 Quick thinking and a pair of mittens saved an elderly couple from a polar bear attack near Coral Harbour, Nunavut, last week. Natuk Paniyuk, 67, says she and her 71-year old husband Mark Paniyuk went to a lake to get water. When she first saw the polar bear she says she couldn't believe her eyes. "I looked again and there it was standing, growling, with its mouth wide open," she said in Inuktitut. "I yelled and it was so close I could see the teeth." Paniyuk says the bear came right at her but she managed to run to her husband nearby. He took out a small pocket knife to try to defend them but every time he tried to stab the bear, it moved out of the way. Finally Paniyuk says she threw her mitts past the bear as a diversion, and the animal chased after them. The couple then threw rocks at the bear and managed to run to their truck. They scared the bear away by shooting at it with their shotgun and it ran off.